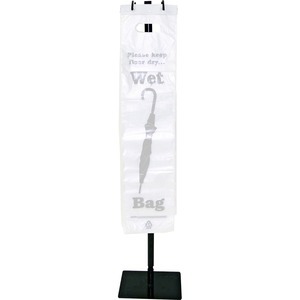 Portable stand is designed to offer recyclable umbrella bags (sold separately) to passersby. Offering bags for umbrella storage on rainy days keeps floors dry and helps prevent slip-and-fall accidents, reducing liability lawsuits. Ideal for entrance and reception areas. Stand features hooks for hanging bags on both sides so you can display bags in two directions. Design also includes plastic feet on base to prevent damage to floor. Stand is made from powder-coated steel.